I payed a brief visit to the Acoustic Guitar Forums. There I saw a post of someone asking advice. 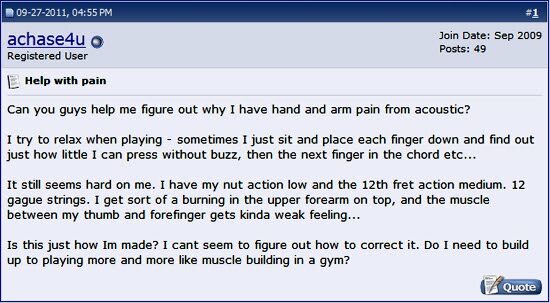 Someone who recently experienced wrist pains. I gave my advice based on my own experience. It was afterward that I started reading through the tread. Most surprised: great advice was given. Something that may not go down in a forums archive, never to be looked upon again. So I want to post those comments on my blog. Starting with the original post and my own comment. Here goes. I'm currently in a mix of thought about continuing to learn left handed guitar, or do the right handed thing with my thumb. I guess I'll be doing a bit of both (so my progression will probably be slower if you look at just one of these styles). It's always been that way with me. There's so many things I like to do. Photoshopin', gaming, video editing, recording music, playing guitar, lifting weights, tricking. I guess I'm as all round as it gets. It just kinda sits in the way of being master at one.